With the first month of the year gone, HBO NOW blasts into February with some great titles to watch, revisit or binge. Some top-notch additions will be made to a video library of the pay-cable channel’s streaming service. Prepare for the second coming! Before we come to the biggest hits, let us concentrate for the moment on a few interesting titles that should grab your attention. The first one is one of the best documentaries in 2018, created by an Oscar-winning filmmaker Morgan Neville Won’t You Be My Neighbor? which focuses on the life and career of beloved children’s TV host Fred Rogers. Other HBO original films to follow include feature-length pro football documentary The Many Lives of Nick Buoniconti, roller-rink subculture exploration United Skates and Jeffrey Wright-starring prison drama O.G. HBO is famous for its TV shows which have won the appreciation of viewers over recent years. The titles which are definitely worth mentioning include: Folklore – a horror anthology exploring the supernatural mythology of six Asian countries, including Indonesia, Japan, Korea, Malaysia, Singapore and Thailand, the sixth season of Last Week Tonight with John Oliver, and the third season of Nic Pizzolatto’s True Detective which arrives at its season finale on February 24, concluding the multi-timeline narrative revolving around Arkansas state police detective Wayne Hays (Oscar winner Mahershala Ali) and the haunting murder case that sends ripples through his entire life. As for the movies, the noteworthy titles which will be leaving the platform in February include a 2017’s film adaptation of CHIPS, Harrison Ford-starring action masterpiece The Fugitive, animated franchise-starter Ice Age, Shane Black crime caper Kiss Kiss, Bang Bang, and Oscar-nominated superhero standout Logan. Apart from the above, HBO NOW brings you a couple of blockbusters this February which deserve being mentioned. The second instalment of the notorius Deadpool franchise which doesn’t need any recommendation. Pure adrenaline. An Oscar-nominated Michael Mann thrill ride starring Tom Cruise, Jamie Foxx and Jada Pinkett Smith. Ang Lee’s bold take on the Marvel superhero character starring Eric Bana and Jennifer Connelly. A 2018 basketball comedy proving that old-timers still have it to win a big one. Starring such NBA legends as Kyrie Irving, Shaquille O’Neal, Chris Webber, Reggie Miller or Nate Robinson. The full list of movies and shows which will appear and leave the HBO platform in February is right below. If you want to be able to stream American lineup of HBO NOW, make sure you become a part of the Smart DNS Proxy family. As many other streaming services, HBO is geo-blocked which means that you may not be able to watch the content if you are not located in the US. 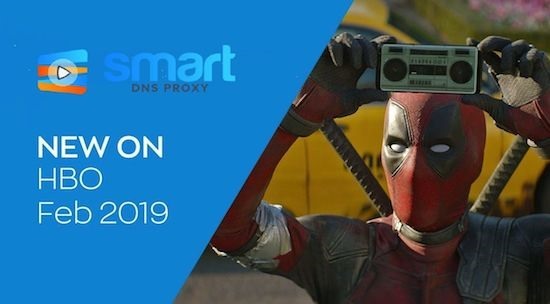 Thanks to Smart DNS Proxy and out technology of smart DNS, VPN and smart VPN, you will be able to unblock the sites which are geo-fenced (not just HBO but also Netflix, Hulu, Amazon Prime Video, and many other services) and enjoy their vast content giving you countless hours of streaming fun wherever you are. Stream with us this February!